Colin Mills, compiler of the Hortus Camdenensis , died in late November 2012 after a short illness. As he always considered the Hortus his legacy, it is his family's intention to keep the site running in perpetuity. It will not, however, be updated in the near future. Upright summer annual with coarsely toothed leaves and very striking single or double flowers in shades of pink, red, blue, purple and white. Variable in height, to 75cm. [RHSD, Hortus]. There are many garden forms. It was figured in its wild form in Curtis’s Botanical Magazine as Callistephus hortensis Cass. 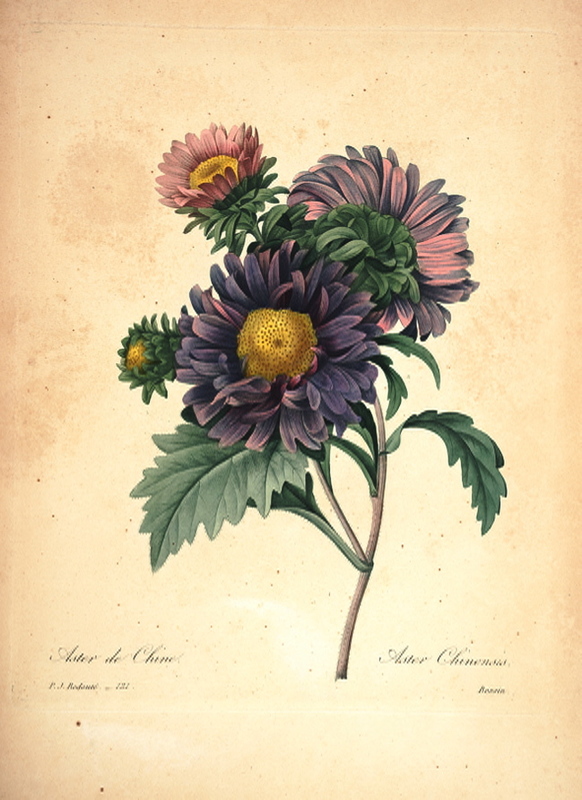 ‘Though the "China Aster" has been repeatedly figured under its garden forms, I know of only two really good representations of it as found in a wild state, one in the "Hortus Elthamensis" of Dillenius, published in 1732, the other in Trew's "Hortus nitidissimus" (1786). There is a fair one in the "Dictionaire des Sciences Naturelles," but it is too much reduced to give a satisfactory idea of the plant, which is now rarely seen except in a condition with the disk flowers ligulate. As a genus Callistephus is distinguished from Aster by the inner scarious involucral bracts, to which most authors add the crown of minute bristles forming what has been considered an outer pappus, but this is sometimes an all but imperceptible character. It has no congeners, and its generally adopted name is posterior to that of Callistemma, also of Cassini, which that author himself suppressed, in consequence of its being so near to Callistemon of Brown. The indigenous form of the China Aster appears to be common in the rocky hills of Northern China, from the neighbourhood of Peking to the Yang-tse-Kiang. There are also specimens in the Kew Herbarium from Eastern Turkestan, Western Tibet and Afghanistan, but in the more western of these localities it is no doubt only known as a cultivated plant, as it is in Japan. According to Aiton it was introduced into England by Ph. Miller in 1731: and Dillenius, who received seeds from Prof. Van Royen of Leyden, figured it in 1732. The specimen here figured flowered in the Herbaceous grounds of the Royal Gardens, Kew, in October, 1897, but did not mature seed. It was raised from seeds presented in 1896 by the Messrs. Vilmorin & Co., which were obtained from the Abbe Farges, who collected them in Eastern Szechuan.’ [BM t.7616/1898]. Garden forms of the Chinese Aster were figured by Redouté. [Redouté Choix pl.121/1833]. German seed of Splendid Aster in 20 varieties was ordered from James Carter, Seedsman and Florist, High Holborn on 8th April, 1846 [MP A2933-1, p.128] from an advertisement in The Gardener's Chronicle, 26.4.45. These are almost certainly China Asters. View a printable version of this page. Hortus Camdenensis is © 2010–2012 by Colin Mills.